THE two-week UN climate summit, which opened yesterday in Katowice, Poland, is fraught with the conflicting beliefs and stands of nations on the largely UN-promoted threat of global climate catastrophe. The conference will last for two weeks, but despite the unusual length, there is little chance that the nations will agree on the existence of the threat, or on the drastic plan of action that the UN is assiduously promoting. Some, like the UN and many nations, are pressing forward with a policy of fear-mongering. Other countries are totally skeptical about the doomsday prediction, and reject the global warming problem itself. Climate alarmists have warned that the world needs to cut fossil fuel emissions by half by 2030 to avert disaster. The Poland summit seeks to firm up a plan to prevent catastrophic climate change. 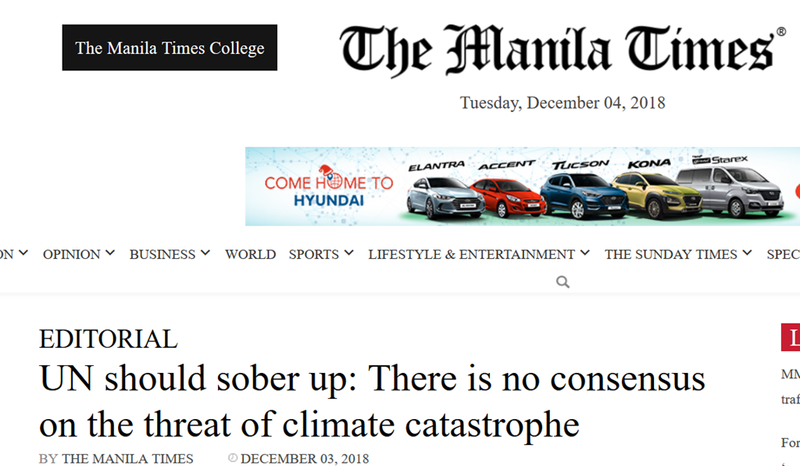 Climate skeptics on the other hand totally reject the UN doomsday prediction; they dismiss the alleged need to cut back on fossil fuels and abandon CO2, which would turn the world economy upside down. 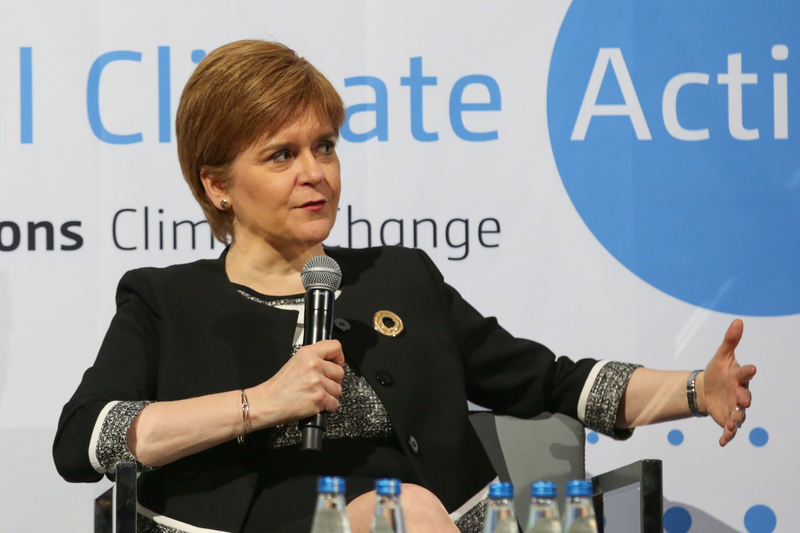 The troubles hounding the Katowice summit are a direct outcome of the extravagant promises and expectations raised by the 2015 Paris Agreement. In Paris three years ago, countries committed to limit global temperature rises to well below two degrees Celsius. Johan Rockstrom, designated director of the Potsdam Institute for Climate Impact Research, said the talks in Katowice are crucial in nailing down how the Paris promises will work in practice. In Katowice, the nations will discuss a proposed rulebook palatable to all 183 states that ratified the Paris deal. This is far from likely. High among the obstacles is the decision of US President Donald Trump to pull out the US from the accord. Last Saturday, during the G20 leaders summit in Buenos Aires, the US reiterated its decision to “withdraw” from the Paris agreement. Brazil, under its new president Jair Bolsonaro, has signified its intent to follow the American lead and withdraw from the accord. Many fear that the US withdrawal will have a domino effect and lead other nations to pull out from the Paris agreement. It is emblematic of the problems hounding the UN‘s climate agenda that the summit is taking place in Katowice, Poland, a mining city, which is sometimes called ‘the coal capital’ of Europe. Coal is a prime target for execution by the UN. Last week, the Polish government announced its plans to open a new coal mine. Meanwhile, the UN just keeps doubling down on its forecast of climate catastrophe. 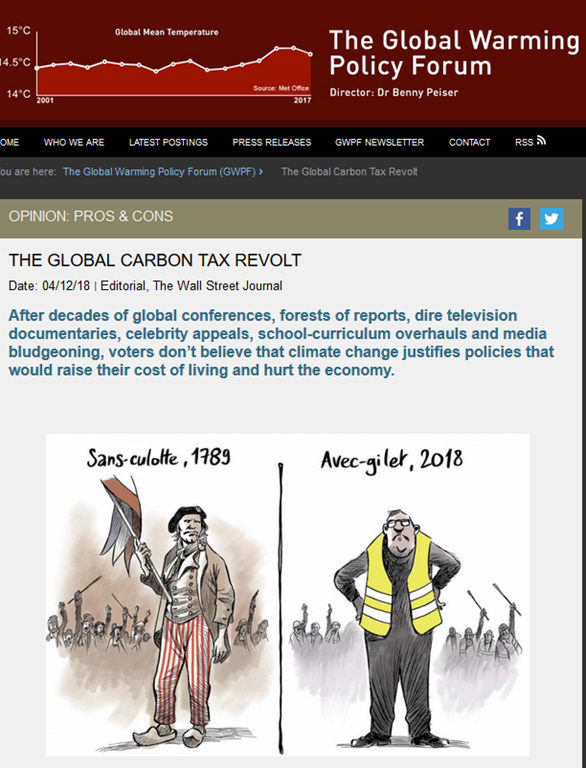 Just last week, the UN Environment Program said the voluntary national contributions agreed in Paris would have to triple if the world was to cap global warming below 2C. According to the Wall Street Journal, when the UN made its doomsday prediction, most of the world yawned. As things stand today, there is clearly no global consensus on a climate catastrophe, or on the way the world should tackle it. We think the UN should sober up. It is its responsibility to review its climate agenda and change the message. If by the end of the Katowice summit on December 14, there is still no consensus on a plan of action, the UN should pull the plug on its climate agenda. We are constantly told that it is the poorer developing countries which will suffer most from climate change and that are the most concerned. As we have already seen with the election of Bolsonaro in Brazil, many do not believe stories about climate catastrophe. Instead they have much more pressing, mundane matters to worry about. ← 22,000 To Attend The Katowice Jolly! If the ‘masses’ are unswayed by this endless barrage of cr.p why do they keep voting for cretins that are proselyting converts? Probably because the masses have been fed with piles of propaganda and don’t realise how much the scam is costing each of them. If there’s a chance of voting for someone that can possibly win (like Trump) people do vote for what they believe. We have Lab & Cons, Lib as an outside shot – all up to their necks in the green ****. Only three times since 1974 when I reached the age to vote have I enthusiastically voted for a candidate for POTUS. Reagan and Trump. All other times I was voting for what I determined was the least of two evils or protest voted by writing in Ronald Reagan both timed Obama was on the ticket because I hated both McCain and Romney and couldn’t bring myself to give them my vote. Everyone wants to save the world until they realize the impact to their standard of living and understand the recipients of their largess will only replace what they are doing without in the process of receiving it. Wealth redistribution doesn’t mean the world is reducing anything. Well yes I’m familiar with the goody middle class socialists who think a lot more should be spent on all sorts of stuff, and alleviating all poverty, and that the money should be raised by tax increases for those that earn, strangely, more than they do. This applies whether their income is 30, 40, 50 60…….k a year. Yawn —- Sorry what was it you asked? Because all politicians are idiots? Because all politicians are sheep? Because all politicians simply follow the latest fads? The “folks” only react AFTER the changes hit them hard. That means that a lot of the UN efforts have successfully been implemented. Until voters realize that most of these plans/decisions/policies originate from only a few global titans, the game will go on. The annual meetings in Davos, and those of the Bilderberg group are the only important events. These people control the money – and they want it all. The UN is their chosen vehicle for global control. As Edenhofer said …. it has nothing to do with climate. It’s all pain and no gain in the UN climate house of horrors. OK for masochists maybe but normal people don’t need it. Time to forget about harmless trace gases and get on with some real issues – but they won’t. We have no major political party in New Zealand which does not conform to the ‘Carbon Dioxide will cause climate problems in the future’ predictions. Therefore they cannot be voted out. Bizarre, for a tiny maritime country with extensive geothermal energy, at mid-latitudes, where any change in climate will have negligible effect. Are there no real problems to worry about, such as earthquakes? Oops, NZ electricity is mostly hydro, it already looks like a greenie dream, but they are never satisfied. I think the term is “crying wolf”. Well the earth isn’t doomed but here in the UK the political claque are dooming the UK public to a very bleak and uncertain future and the green agenda is just one transport wagon on the cattle truck train to economic and social catastophe and eventual oblivion. Little Emmanuel should have listened to Uncle Donald instead of Aunt Angela. Talking about small numbers, I found this comment in Canada’s National Post a couple of days ago – it points out the futility of Climate change which remains a wealth re-distribution exercise by the IPCC political arm. Okay, let’s look at this logically. GHG’s make up 2% of our atmosphere. Of this 2%, only 3.62% is CO2 and man affected CO2 counts for 3.4%. In our atmosphere there is therefore 0.0025% (25 parts per million) man induced CO2. Note that man does not “make” CO2 and that there is not one more molecule of carbon on earth today than when the earth was formed and note that the Al Gore’s of the world do not give you the CO2 in our total atmosphere but only of the 2%. Canada emits 1.58% of global CO2 making Canada’s share in the atmosphere equal to 0.000039%. By spending trillions of dollars and impoverishing Nations through lack off business investment, inflated costs for all goods and services due to Carbon Taxes (plus GST in Canada) Trudeau wants to reduce this small number by 20% making Canada’s contribution 0.000038% CO2 in the global atmosphere – a reduction of 0.01 parts per million. Well, hey, if only we could measure that small change Trudeau could really brag about having done something. The qualitative detection limit for CO2 is 200 parts per million while Trudeau wants to impoverish us for a theoretical reduction of 0.01 parts per million, and the UN is saying that the sky is falling and that we are all doomed. The scary part of all this is What is their motivation? Could it be that they just all believe this that such an infinitely small fluctuation will destroy the earth? The climate is changing, as it has always done and we have gone through 3 similar periods of warming and cooling in the past – without man’s input. So why are they getting so worked up? Control? A common enemy for all Mankind (and of course even for Trudeau’s stupid Peoplekind)? Too bad they have silenced all the scientists (much as the earth is flat people did in the middle ages) so anyone who wants to keep his job does not dare speak out. Trudeau even said, publicly in Spring 2018, that those who do not believe man is causing this “must believe in female genital mutilation”…What? What a brain that boy has and Eastern Canada loves him. Hahahaha! That doesn’t say much for them.